If you’re curious why School of Coaching Mastery chose to prepare coaches for IAC Coach Certification, then you’ll want to read this. Interestingly, both the IAC and the ICF were founded by the same man, Thomas J Leonard, who is often referred to as the Founder of the Coaching Profession. Thomas passed away suddenly in 2003, but in his lifetime, he did more to raise the standards of coaching than anyone before or since. Thomas founded the ICF in 1995, when the coach profession was still quite young. At the time, professional coaching was just beginning to establish itself as a distinct profession, with different skills and deliverables from any other profession, such as consulting or psychotherapy, two professions that are often confused with coaching. Because the profession of coaching was so new and evolving so fast, it was difficult to define standards for certified coaching, so instead, ICF certification was based on the amount of training a coach had and how many paid hours of coaching he/she had documented. It used a “competency” model and it usually took years for a coach to achieve ICF certification. Thomas decided that coach certification should be based solely on the coach’s ability to coach and on their pledge to uphold a high standard of ethics as professional coaches, because in the end, that’s all that really mattered. By that time, the ICF was completely independent of Thomas Leonard. The ICF had its own board of directors and administrators who told Thomas that they weren’t interested in changing their certification process. Being the leader and maverick that he was, Thomas simply founded a new not-for-profit certifying organization in 2003 that bases its certification solely on a coach’s ability to demonstrate masterful coaching skills and a high level of ethics. That organization is the IAC and SCM instructors are proud to have assisted most IAC Certified Coaches to get certified. In fact, all of SCM's instructors, board of advisors and mentor coaches are IAC Certified Coaches. Coach Certification, training, ethics and professionalism are becoming increasingly important to businesses and consumers, so although it's technically not necessary that a coach have certification, it's a very good idea. We believe IAC Coach Certification measures what's really important in coaching, which is mastery. That's why we chose it. Have More Questions About Becoming a Coach? 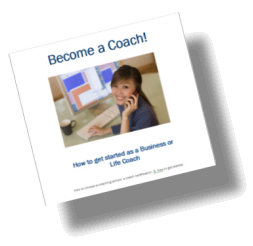 Download our free Become a Coach eBook. It contains a free 8-hour coach training program, too!